Welcome to the SAVE NEW ENGLAND website! We are an independent Baptist Ministry assisting local churches to fulfill the Great Commission and reach New England with the glorious Gospel of Jesus Christ. Strong Christian principles were the foundation of life in New England for generations; however, that Christian heritage has been forgotten by most New Englanders. Today, New England cities and towns are in need of strong Bible preaching and bold personal soulwinning to bring them back to God. Atheism, humanism, agnosticism, hedonism and even paganism can be found in abundance among the unchurched. 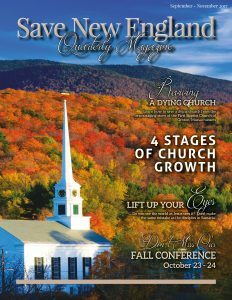 Churches are plentiful across New England yet most have turned their backs on the Word of God and the God of the Word long ago. New England is home to some of the most influential cities, people, businesses, and universities in the world. If we lose New England, we will lose the country. Please take a few minutes to look over our website and learn about this important ministry. There is hope for New England! Jesus still saves, God still transforms, and miracles still happen! God has given us a vision and a plan to SAVE NEW ENGLAND. Will you help us? Start here.